With the arrival of February, the coldest season, many cities in Japan have been hit by a cold wave, but there has been relatively calm and peaceful days here in Kitakyushu. On the St. Valentine’s day, the SPC (Special Course) requested by the client was held. We had six staff including instructor to deliver the Helicopter Underwater Egress Training in our training pool. The number of the staff is essential for the quality control of the training. Not only because of its specificity of content but also for the safety, we needed to have specific number of staff for the training. 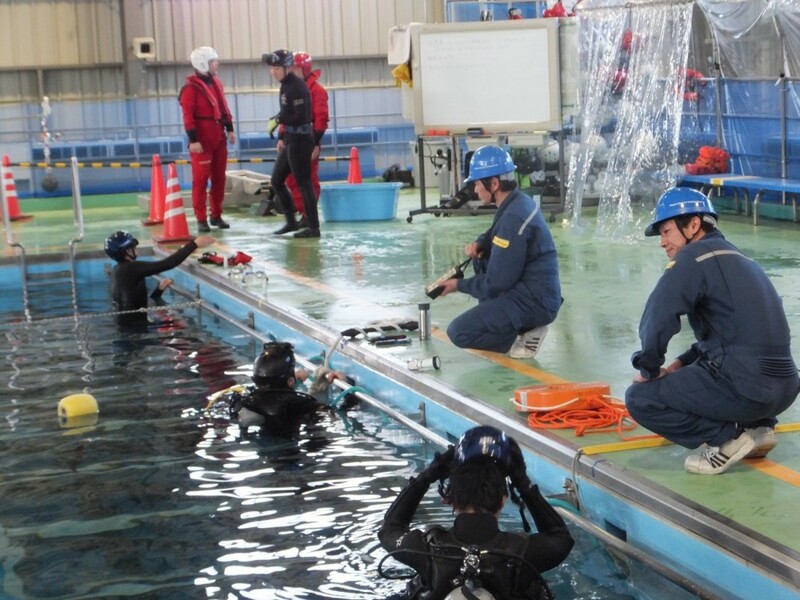 Under the water, two instructors were responding directly to the delegates’ condition and anxiety as well as their behavior and the training contents itself, two divers were supporting the instructors and monitoring the safety. On the poolside deck, the gigantic crane was manipulated by the winch operator to control the movement of the helicopter simulator to support the training by the order of the instructor. We also had deck assistant, who are monitoring the safety around poolside in order to respond the delegates waiting for their turn and if emergency happens. The quality during the delivery of the training is maintained in this wise. The photo below is a scene from the training. Each staff work on to fulfilled their roles and responsibility so that the delegates could master the competence safely and efficiently. Of course, we allocate the instructors and staff as appropriate for all other trainings in order to deliver the safe training for our clients. It’s our sincere desire to pursue maintaining high standard of the training quality. If you have any question while browsing our web-site, please feel free to contact us, as we’ll try our best to improve the quality to meet your expectations.